Affinity purified against recombinant protein and then depleted against GST. 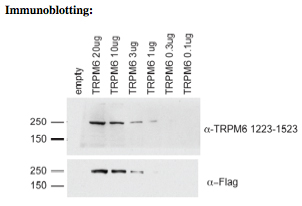 Extracts for HEK293 cells overexpressing FLAG-TRPM6 were subjected to SDS-PAGE, transfered to nitrocellulose and immunoblotted with either alpha-flag or anti-trpm6. 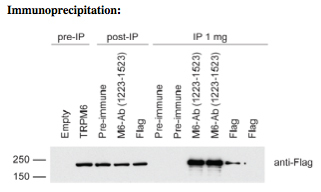 1 mg of HEK293 cell extracts over expressing FLAG-TRPM6 were immunoprecipitated using either pre-immune serum, anti-TRPM6 or antiFLAG antibodies. The resulting immunoprecipitates were subjected to SDS-PAGE, transferred to nitrocellulose and immunonlotted with anti-FLAG antibody.